Only properly calibrated measuring devices can ensure the quality of your products testing. When you buy test equipment from Mecmesin, you can be sure that it has been manufactured to the highest possible standards. It will also have been calibrated in our dedicated climate-controlled calibration facility by well-trained and experienced staff. All Mecmesin factory calibrations are calculated according to the methods described in ISO17025, and our procedures, which meet the requirements of BSEN10012, are audited as part of our ISO9001 accreditation. 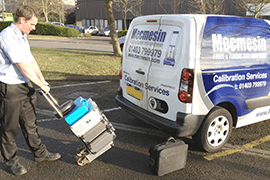 Calibration at Mecmesin provides you with peace of mind, knowing that your instrument is measuring accurately. Any measurement transducer requires regular verification and, if necessary, recalibration. Only specialist Mecmesin staff, either at our factory or our distributor’s facilities, can calibrate or adjust Mecmesin products to bring them back into calibration. Whether you require ad-hoc fast-track calibration on a single device or a 3-year service and calibration programme on multiple machines, we can tailor an agreement to suit your needs. 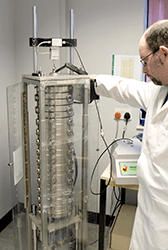 We have a fully-equipped laboratory where we can calibrate force products up to 50 kN, using a mixture of calibrated and traceable deadweights and a precision hydraulic pressure transfer system. All Mecmesin products come with a comprehensive 2-year warranty so in the extremely unlikely event of anything going wrong, Mecmesin promises to cover all costs of repair or replacement.